Something has been really frustrating me recently about Facebook – and it’s been covered lots of other blogs – the reach that pages are getting with their posts has seemingly plummeted since Facebook has moved towards a model of trying to get you to “boost” your content – or rather, pay to get a wider audience to see it. But when you’re a not for profit, or a community website paying to promote content just isn’t an option….and as we’ve posted before it may not actually be the best option. Insights and more importantly reach – specifically how to reach more people is something we get asked about a fair bit at Social Media Surgeries and when I got asked about it again this week I decided to do some digging to try and work out 1. What on is going on with reach and 2. Can we improve page reach without paying? 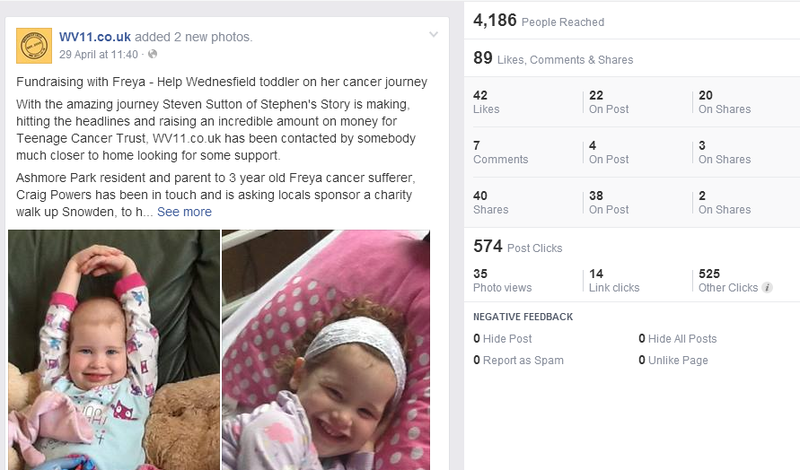 The other day I posted a story about young girl Freya Powers, to the WV11 website and facebook page – Freya has not long been diagnosed with non-hodgkins lymphoma and her parents are fundraising for the cancer ward she is being treated on. We basically put a call out asking for help with the fundraising. It was a popular post which is why I’ve chosen this one to look at. BUT 38 people have shared this and our reach is less that our total page likes? I know from past experience that when you see shares like that the reach is normally way way over the total numbers of likes on a our page, so I looked deeper. 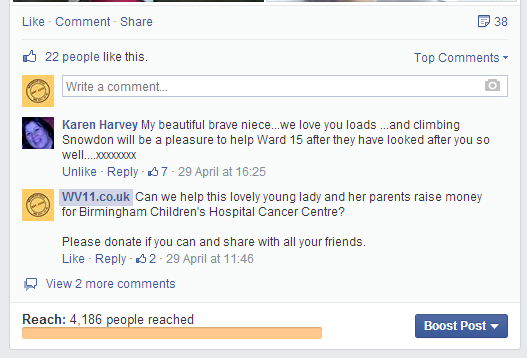 It’s still showing a reach of 4,168 put but it’s now showing 42 likes – 22 on our page – and a further 20 on shares…. And then I realised something – on previous versions of Facebook insights you could view a separate figure for viral reach and this wasn’t showing, so I went searching. I download the full insights file…. So it appears facebook have started to combine pages organic reach with it’s viral reach in its overview and when looked at like that it’s worse than I thought. Facebook have delivered our content to 32% of the people who liked our page – the rest of the figures have come from people sharing the post which is a huge drop in reach to what we were seeing just 12 months ago. It is well worth a read but essentially it says – while we add more people and more things to our facebook feed by making friends and liking “stuff” – the amount of time we spend looking at the feed stays the same so facebook are working to try and make that time relevant – which means filtering irrelevant content. Which means followers won’t always see the stuff we want them to see. It also has a really interesting simplification on the algorithm facebook uses to filter posts. Facebook is penalising pages for link bait tactics and spammy posts. Post memes or banal “share this if you love your mom” or “1 like = 1 respect” text and image based content or over share repetitive content you are going to see a sharp reduction in the amount of places your content is seen. So how do we stay on the right side of facebook’s filtering and increase your reach without paying to boost your content? Based on the post from Wv11 I shared above we have an average post to followers reach of 32% – which by looking at all the sites I’ve read through today puts us at the higher end of the scale for organic (non paid for) reach . Be useful and relevant – is the content something your page followers would want to see – is it the type of posts they are used to seeing? Write about the things you know about and your audience will care about. Accessible content – Think mobile as well as desktop. Lots of people use their mobile to browse the internet and specifically Facebook , is your content mobile friendly –When we post links to stories try and summarise that content for mobile only readers – some people still wont or cant click on on external links from the page, especially those with contracts or PAYG mobiles that include free facebook browsing but not a lot of other data. Timing. Facebook insights are a wonderful thing. They are broken down to such an extent that we can even know when our followers are online – We get a graph that averages hourly visitor numbers over days – but we can also see data for each day of the week which allows us to post when potentially the most people are online to reach the widest audience possible. Don’t post repetitive content – if we want to re-share something – we reword it or post content with a different photograph so that facebook can see your making an effort to share something new. I don’t deny it’s frustrating to have put the effort in to build and audience of over 6000 to only reach a third of them. But in the short term a third of 6000 is still 2000 more people to connect with than if Facebook didn’t exist and in the long term hopefully as Facebook filtering gets better and spammy pages are penalized by following these rules the relevant, informative pages will see their reach stabilise, or increase. #fundbrum – how do you find funding opportunities in Birmingham? #futureshift notes – Joel Blake on grassroots change.